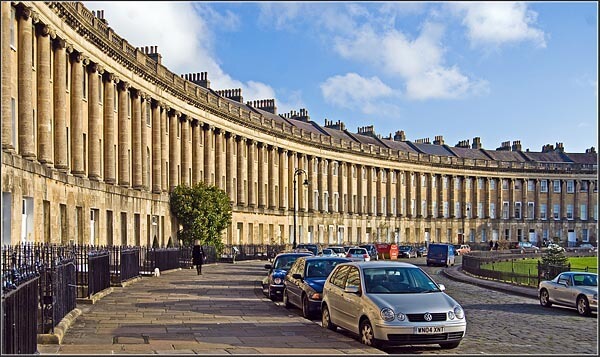 Bath, England, is home to many wonderful attractions, such as its numerous art museums or its astronomy museum. However, one of the best reasons to visit Bath are the many examples of Georgian architecture you can see throughout the city. The beautiful decorative moldings and the exquisitely designed windows are superb examples of the style, and worth admiring. Perhaps the best example of Georgian architecture in Bath is the Royal Crescent, pictured above. Another good example are the Roman Baths and the Bath Abbey. From the strong columns to the many intricate moldings, you can see the influence of Georgian architecture everywhere you look there. Pulteney Bridge. The windows all around the bridge are very true to the Georgian style. If you are visiting Bath, be sure to take some time to walk around the town and admire all the lovely architecture around you. Last updated by Amanda Odoerfer on 10 January, 2011 in Travel.